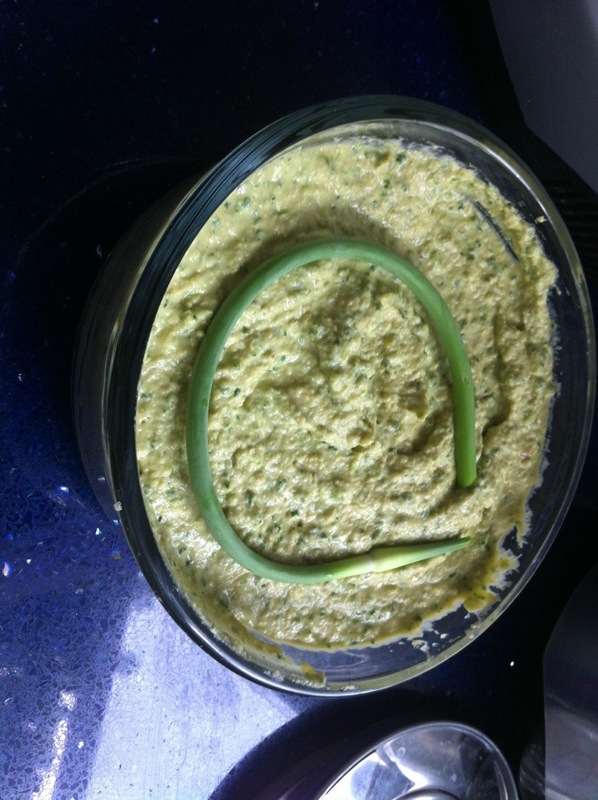 I made a hummus at the beginning of the summer, and it was one of my favourites yet — Kale & Garlic Scape Hummus! That curly green bit on top is a garlic scape. Garlic scapes are the flower stalks that come out of the garlic bulb. The scapes need to be harvested so that the garlic plant can focus its growing attentions on the bulb, and luckily they are delicious to eat! Whenever it’s garlic scape time (usually June-ish in Ontario) I make sure to get as many as I can get my hands on — my veggie box suppliers (Front Door Organics) have them seasonally, as do the local farmers’ markets. I use them wherever I would use garlic: in stirfries, quinoa salads, and in my very favourite (and vegan!) Garlic Scape Pesto. Now that I know they are so good in hummus, I’m going to be extra vigilent in getting them! Of course, September in Ontario is not the time for garlic scapes. So if you want to make this hummus RIGHT NOW you can do an excellent job by substituting regular garlic cloves. And then remember next summer that you need to make it again with garlic scapes. 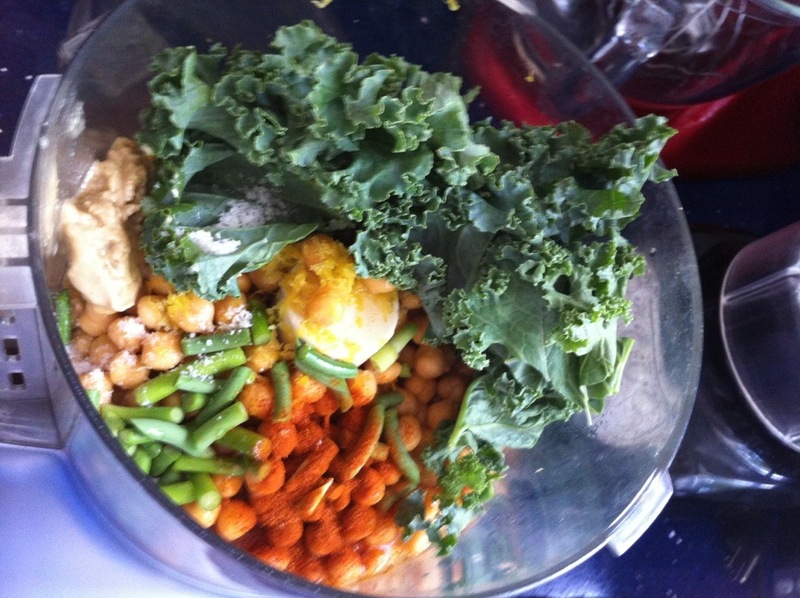 The kale in this makes the hummus go bright green. I think it’s extra healthy AND extra tasty this way. I find the bitterness in the kale isn’t super strong here, but this is a way to highlight kale, and not a way to hide its flavour. I’ve been reading all about kale over at World’s Healthiest Foods, and discovered that 1 cup of cooked kale has 1327.6% of one’s daily vitamin K, 354.1% of vitamin A and 88.8% of vitamin C intake. Go Kale! I knew it was good for you, but that’s pretty amazing. I found (as with most hümmi) that this one tastes better after an overnight rest in the fridge. The garlic flavour in most hummus tends to be quite sharp right after you make it, but mellows out and blends in with the rest of the hummus flavours after a night’s rest. Enjoy, reveling in the fact that it is indeed healthy AND delicious. What a lovely color assortment in your food processor! This hummus looks delish! Oh yum! I love when I find garlic scapes. They make everything wonderful. I’ve never heard of a garlic scape! And I’ve never thought to put kale in hummus. This sounds fantastic! I have to say, it’s really tasty!! This recipe looks so incredibly wonderful! I shared it (and your photo) on my link post this week, I hope you don’t mind. Thanks so much, Stefanie! Glad you like the look of it. I can promise you it’s delicious! This looks soooo tasty! I wish I had more garlic scapes, so that I could whip this up right now! I’m keeping this recipe to try next spring when the garlic scapes debut at our farmers’ markets. Can’t wait!